This week, we are pleased to republish a recent article which appeared within The Catalogue Raisonne’s website blog written by Jason Wright of Silver Shadows and with a forward by Brian Liddy. By Jason Wright, September 2018. A recent discovery in the USA of a double-sided locket containing a pair of daguerreotypes is exciting in its own right. 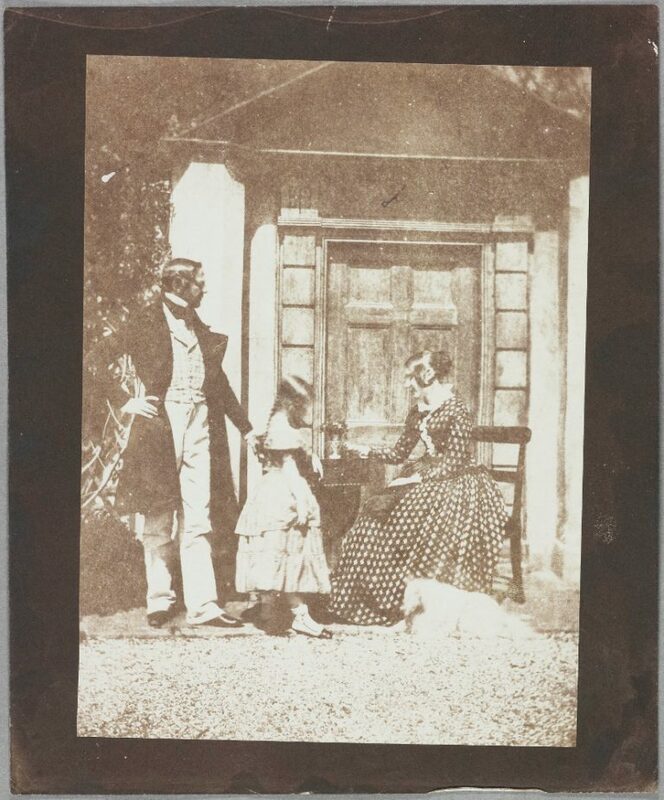 The anonymous yet charming piece of early photographic jewellery shows what looks like an extended family group posed in an outdoor setting, partially framed by a handsome doorway which also acts as a backdrop. 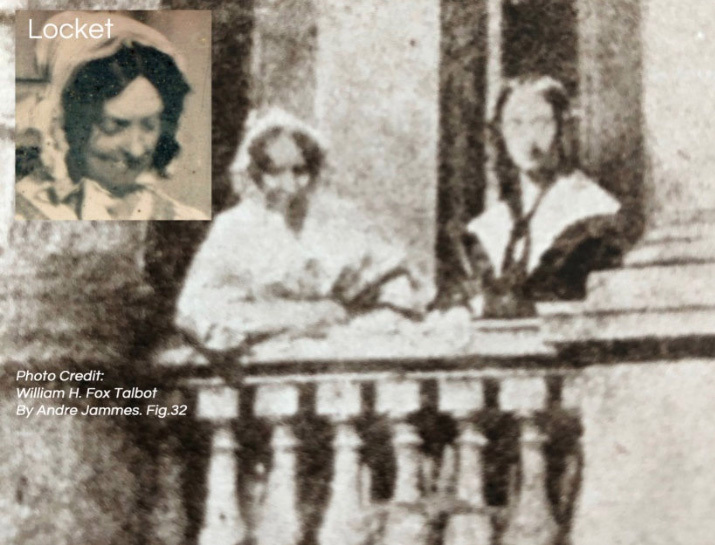 Initially there was little clue as to the possible importance of the two images and certainly no obvious link to either the Talbot, Calvert Jones or Llewelyn families, but in time it looked like there might be. I contacted Professor Larry Schaaf via his Talbot Catalogue Raisonné website to ask his opinion. He was supportive and asked if I might be willing to write a blog. How could I refuse? The two circular daguerreotypes are set in a plain double-sided early Victorian locket. One side features an older lady who appears to be between sixty and seventy years of age, a young girl of between five and eight years old, and a small white dog. The other side features a woman of between thirty to forty years of age, a middle-aged gentleman, and the same dog. All are set outside what is presumably the front door of a substantial building, perhaps their home. The style of clothing and physical makeup of the plate suggest a date range between 1843 and 1845. It is undoubtedly British in origin. On first glance, the sitters and setting looked familiar to me, but there was nothing I could immediately put my finger on. The older lady and the white dog in particular focused my attention. I had a recollection of seeing them before, but where? A hunch took me to look at the Talbot family circle. One might think this fanciful. What are the chances? But reference to good old-fashioned books dedicated to Talbot’s circle and Talbot Catalogue Raisonné website seemed to add substance to this potential connection. Originally, I had set out to possibly identify the sitters based purely on visual clues such as their likenesses and surroundings in other photographs. In time, with close attention to previously known likenesses on the Talbot project website, it became clear that all six of the anonymous sitters in the double daguerreotype portraits matched physically and chronologically with the family circle of both Talbot and Calvert Jones. The identities I potentially proposed to Larry were Lady Mary Lucy Cole, neé Fox-Strangways (Henry Talbot’s aunt), Henry Petty Fitzmaurice who was the 3rd Marquis of Lansdowne (Talbot’s uncle), the Rev. 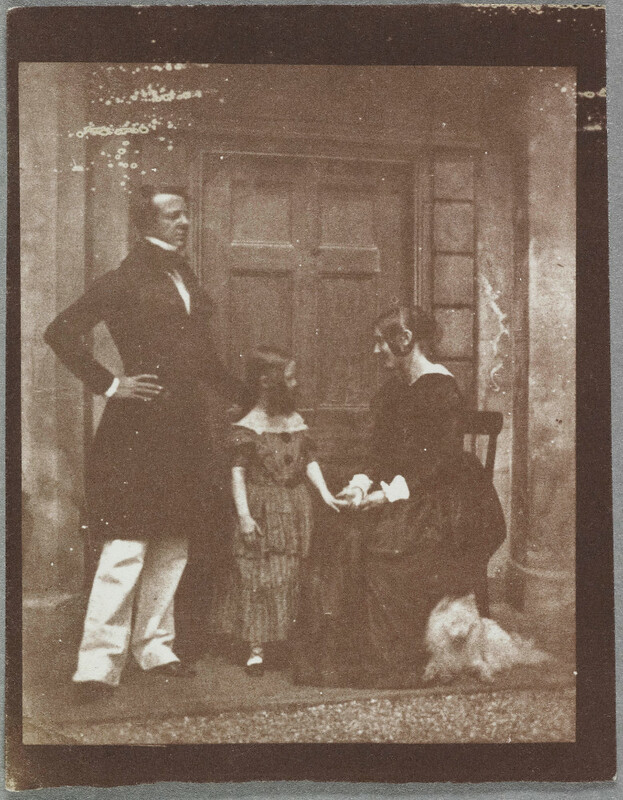 Calvert Richard Jones and his wife, Anne Jones, together with their daughter Christina, but how could I be certain? The final sitter, Lady Talbot’s Japanese Spitz dog, was to be key to the entire process. In a sense, the portrait photographs on paper by Jones, gleaned from various sources, underwrote the identity of the sitters in the locket daguerreotypes. The same timeframe between the paper photographs and the daguerreotypes combined with the shared doorway setting and familial connections meant only a small pool of photographers could have been responsible for the daguerreotypes. The prime candidate was either Jones himself (but he was also a likely sitter) or his close family friend, John Dillwyn Llewelyn. Just days before this blog was due for publication I returned to the Talbot catalogue raisonné to confirm photo credits. It was then that a new set of Jones images popped up! New images are continually added to the catalogue which makes discoveries like this more of a possibility [Editor: I urge you all to try to keep up!]. A smoking gun which confirmed most, if not all of my original attributions had been found. I scrutinized these new images. For almost an hour I stared and stared at facial characteristics in detail before my eyes glazed over, weary from six months of searching and gleaning, this really was a eureka experience. Not only was there a single image, there were six which helped verify my find. 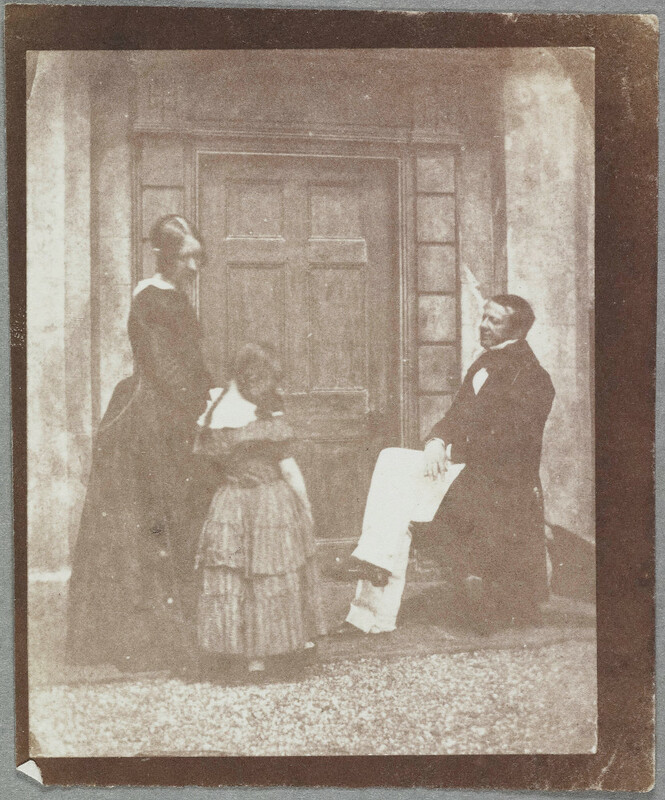 The salt prints and calotypes in question showed Jones, his wife Anne, and daughter Christina. They also showed what may be the family’s Japanese Spitz dog outside that unique family home doorway. 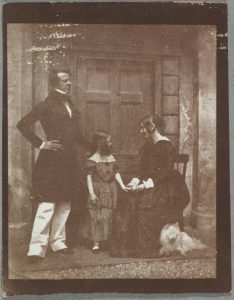 Not only do the Jones family appear uncannily like the figures in the locket together with the family dog (previously thought to be Lady Talbot’s as it appears in a daguerreotype of her by Llewelyn at Margam by J. D. Llewelyn) but the distinctive doorway is matched brick for brick and plank for plank. 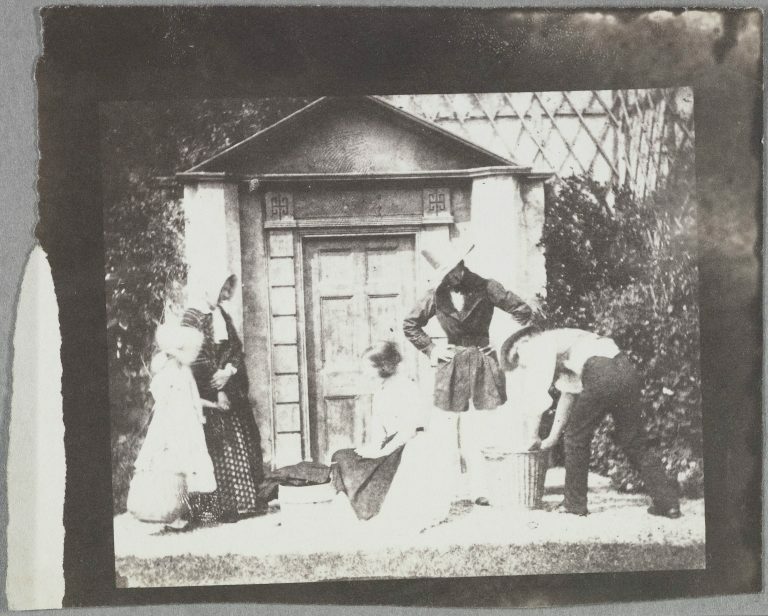 The provenance of these six paper photographs is cast-iron as they were gifted to the Science Museum by Talbot’s granddaughter, Matilda Talbot, in 1934 and are now held by the National Science and Media Museum (previously known as the National Media Museum, Bradford). 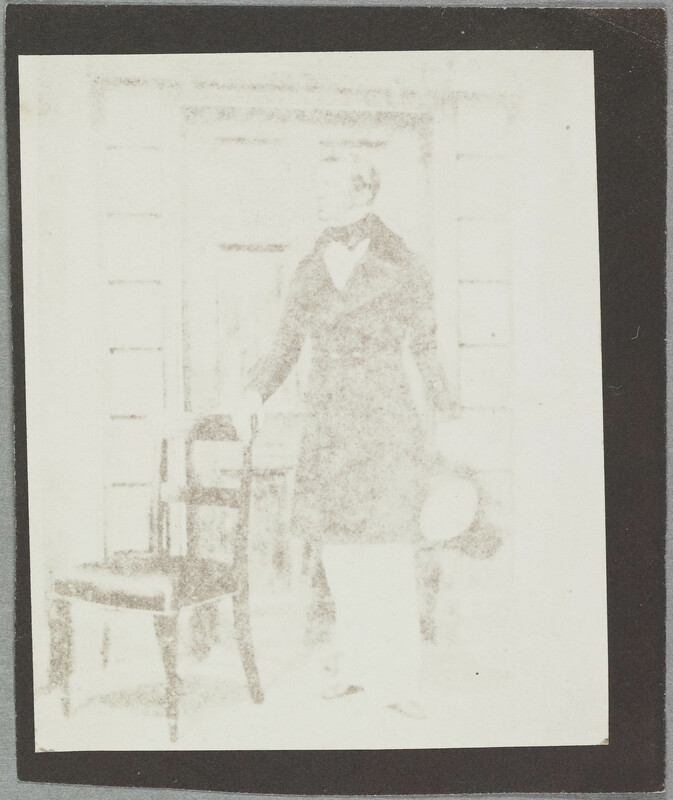 To top it all, Jones is identified in the Talbot catalogue raisonné as the likely photographer of the six salt paper prints associated with the pair of locket daguerreotype. Could Jones therefore also be the photographer of the locket daguerreotypes? The clearest and closest reference image of the six is Schaaf number 2895 which shows a family group portrait with Calvert Jones and his wife, Anne, together with their daughter together with the family dog, our Japanese Spitz. Given the multitude of images, and the fact that they were taken outside the same house as our daguerreotypes, all be it at different times as the Jones family are wearing different clothes in each, it is a distinct possibility that these photographs were taken by Jones outside the doorway to his one-time home, Veranda House in Swansea. The resulting evidence confirms three of the main sitters from the Jones family and strongly suggests the identity of other sitters by association. Lady Mary Lucy Talbot and Henry Petty-Fitzmaurice were friends of the Joneses and Llewelyn’s and were pictured with them on multiple occasions. If the main photographer of the daguerreotype locket was not Jones then it is likely he had a hand strong hand in how the finished photograph looked, in composing the sitters and perhaps deciding the setting in front of the doorway. 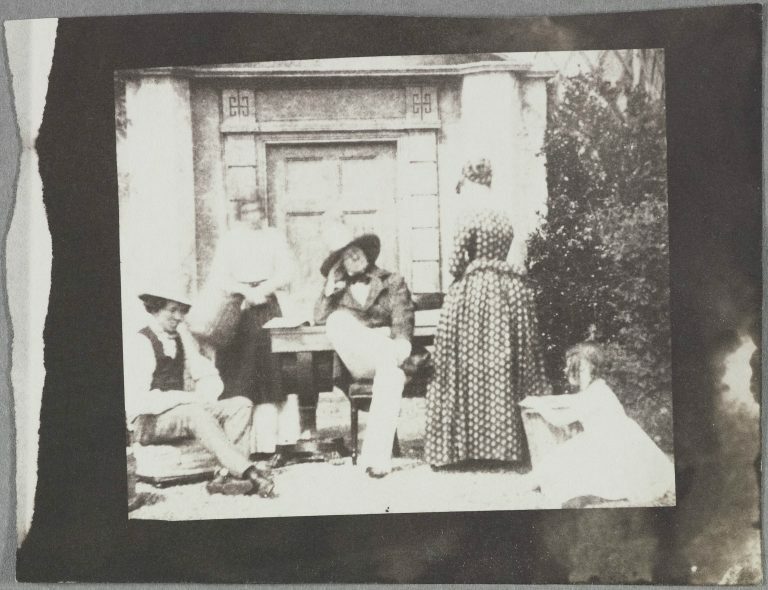 Noel Chanan, author of the monograph dedicated to John Dillwyn Llewelyn, The Photographer of Penllergare (2013) made a good case for a collaboration between good friends, Jones and Llewelyn. Based on this there is the possibility of a daguerreotype locket produced by Jones together with Llewelyn and his small format daguerreotype camera. This daguerreotype partnership is suggested by several earlier photographic images. Chanan believes all four whole plate daguerreotypes by Llewelyn made of Penllergare between March and August 1841 were similarly made in partnership with Jones. Within the Llewelyn collection, there is nothing to suggest that Llewelyn himself ever used a large format camera on his own. When Jones was away in Paris he purchased a small format camera for use on his onward travels in France and Italy. The evidence points to a collaboration between the two photographers during the daguerreotype period. 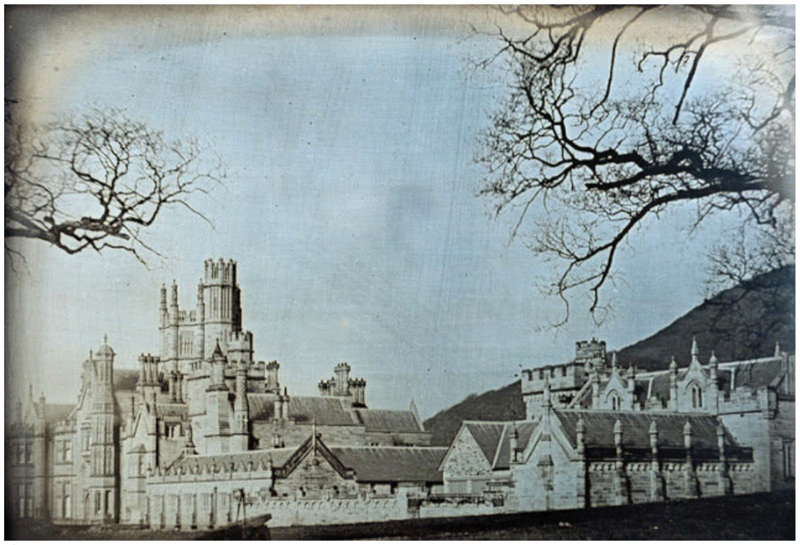 In 1843 Jones is photographed by Llewelyn on the steps of Margam, once again in possession of his whole-plate camera. 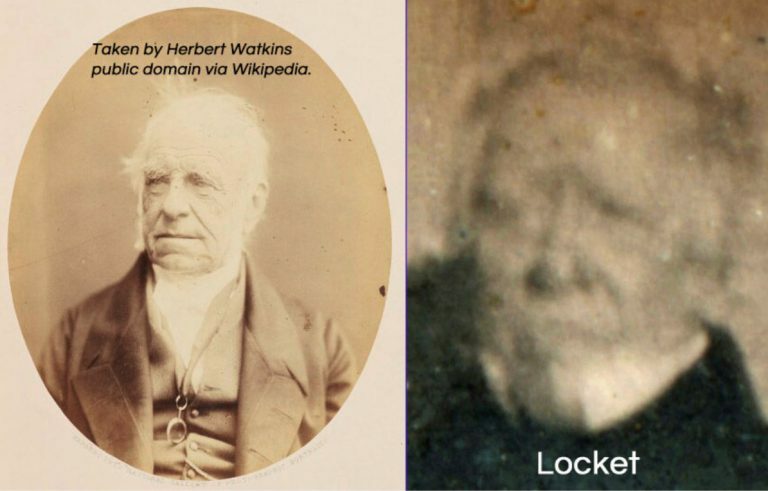 The new information confirms the sitters are within the Talbot-Jones photographic circle while the involvement of Jones, and perhaps Llewelyn, takes the historical importance of locket to a new level as possibly only the second and third daguerreotype involving the Reverend Calvert Richard Jones to have survived.